I recently came across an amazing data set called the “Conflict Catalog”, created by Peter Brecke, which details 600 years of armed conflict from 1400 to 2000. 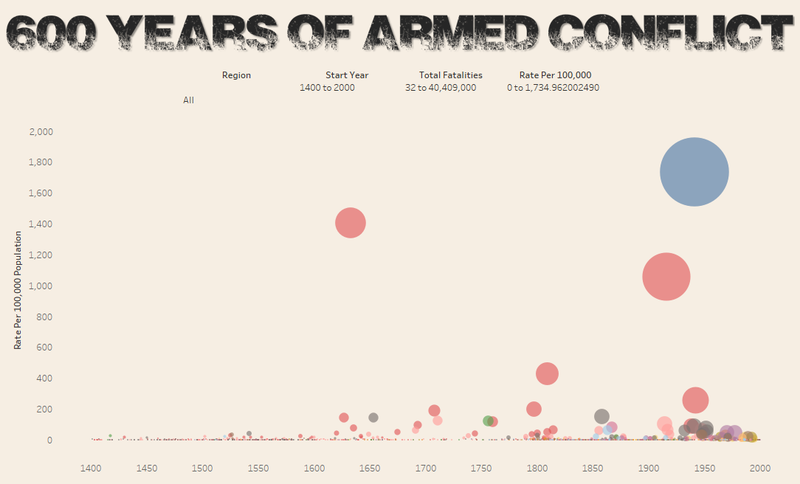 While the data set is a bit dated, not accounting for the many conflicts which have occurred in the past 17 years, it does provide an amazing historic view of how such conflict has impacted our world. As I was researching this data set further and beginning to plan an analysis, I came upon an incredibly detailed article on Our World in Data, called War and Peace, which includes analysis and numerous charts dissecting Mr. Brecke’s data set, along with other sources. A visual at the very top of the article caught my eye immediately. 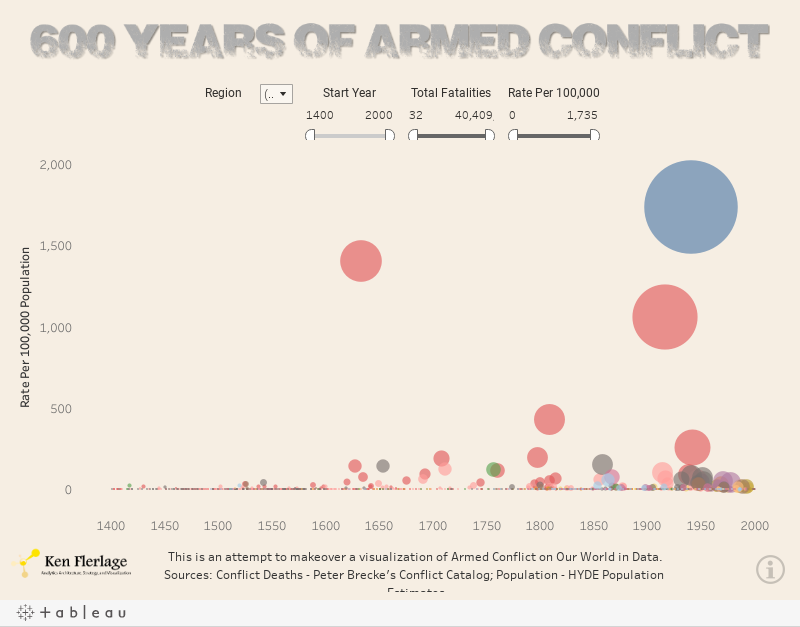 At first, I found this to be an extremely interesting visualization, primarily because of the fact that it is able to communicate both the total number of casualties of each conflict and the rate relative to the world population at the time. But, I quickly became frustrated with it for a few different reasons. First, the y-axis, which shows the casualty rate, uses a variable scale. The first half of the axis takes you up to a rate of about 10 per 100,000 people, but the next half goes from 10 to 2,000. The intention is clear—the variability of the axis allows you to see the much smaller conflicts which would have otherwise been stacked on top of each other at the bottom. 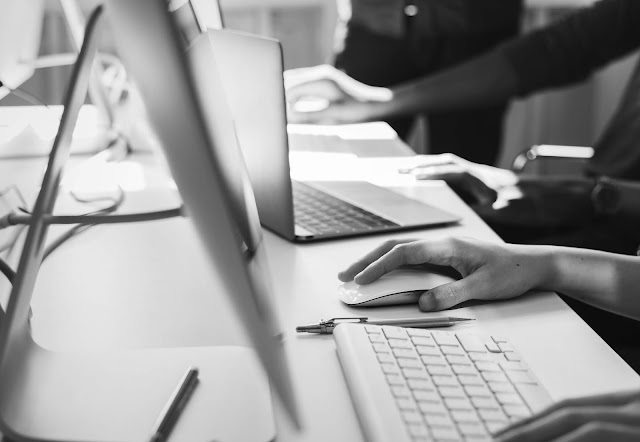 But, I feel that the result is a somewhat confusing view of the data which gives the visual impression that the rates are much higher they actually are. Take the First and Second World Wars, for example. From my calculations, the casualty rate for WWI was 1,056 per 100,000 people, while WWII’s rate was 1,735, about a 65% difference, but the variable scale of this chart gives the impression that the casualty rates are much closer. 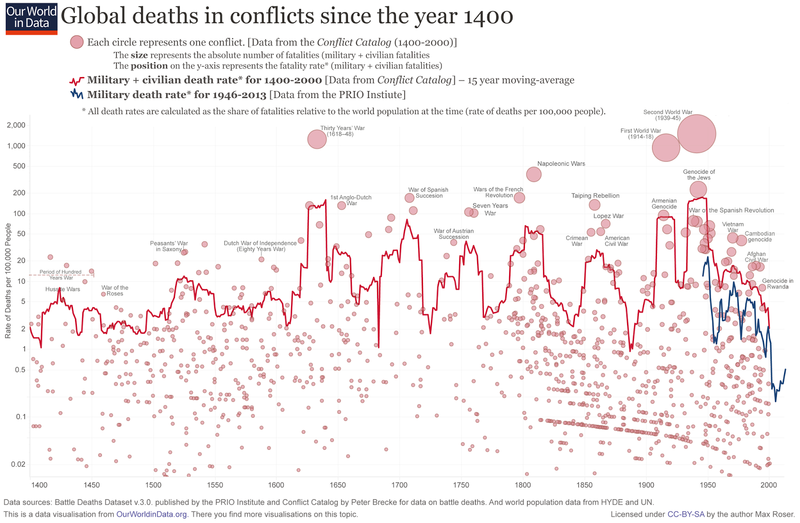 My second issue with the chart is that it shows thousands of individual conflicts over the past 600 years, but there is no way to get any information about them aside from the handful with labels. And even those with labels fail to provide much information. For instance, you can visually see that WWII had the highest number casualties (because it’s the largest bubble), but you have no idea how many casualties there were in total. One final problem I have with the chart is its color or rather, its lack thereof. Color provides an opportunity to help the viewer differentiate some aspect of the data. For instance, color could be used to indicate the region in which the conflict occurred. But the author chooses to use red only, missing his chance to provide a little more information to the viewer. With this chart having so much potential, I just could not resist doing a bit of a makeover in an attempt to address some of these flaws. So, I obtained the Conflict Catalog Data Set as well as the HYDE Population Estimates and set out to create a visualization in Tableau. Here’s the result. My version works quite similarly to the original, sizing each bubble based on the total number of causalities and positioning each bubble vertically based on the casualty rate (as a percentage of total world population at the time). But, I’ve used a consistent scale on the y-axis to help clarify the differences between the conflicts. Due to this change, for example, the rate difference between WWI and WWII is much more noticeable. I’ve also leveraged color to indicate one of the 13 regions in the data set (you can hover over the information icon in the bottom right corner to see the color key). Finally, because I’m using Tableau, I am able to leverage tooltips to give you information about each conflict. You can now hover over any conflict, large or small, to get its name, start and end years, region, number of casualties, and casualty rate. Now, there is definitely one reasonable criticism of my version when compared to the original—the fact that the smaller bubbles are bunched together at the bottom and are, therefore, very difficult to see and interact with. This is, of course, the reason why the original chart had a variable scale y-axis. To address this problem, I’ve added a number of filters for region, year, casualties, and casualty rate. So if, for example, you’d like to drill in on the conflicts between 1500 and 1600, you can simply change the date range and you’ll be able to zoom into that section of the chart, as shown below.  As usual, I’ve had to size down my visualization in order for them to fit nicely on this blog, but if your device can handle a higher resolution, I highly recommend checking out the full-size visualization, which you can find here. Before I wrap this post, I wanted to take this opportunity to spotlight a non-profit which is doing great work promoting peace throughout the world. Religions for Peace is a cooperative of religious communities, from multiple faiths, who are committed to “leading efforts to advance effective multi-religious cooperation for peace on global, regional, national and local levels while ensuring that the religious communities organized on these same levels assume and exercise appropriate leadership and ownership of these efforts.” Established in 1970, they have done tremendous work throughout the world, including helping to end the civil war in Sierra Leone, promoting a peaceful, multi-religious, multi-ethnic Bosnia, and more recently, they are actively working to help resolve sectarian violence in Syria. For more information or to make a donation, please visit www.religionsforpeace.org.